The fourth exhibition in the Raw/Cooked series presents the work of Bedford-Stuyvesant–based artist Heather Hart. Hart built a large-scale structure titled The Eastern Oracle: We Will Tear the Roof Off the Mother for display in the Museum’s fifth-floor rotunda. She describes the work as “an independent rooftop, removed from its house, and dropped from the sky to live its own life in a new context. 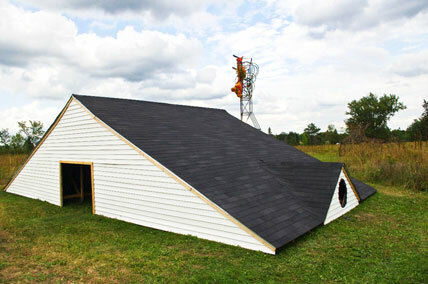 A rooftop can refer to home, stability, or shelter, but in this context, it is also an action of reclaiming power.” The work makes reference to the Museum’s ancient Egyptian and African collections and to the Jan Martense Schenck House, a two-room structure built in 1676 that is Brooklyn’s second-oldest example of Dutch-American architecture, and the oldest architecture in the Museum’s period room collection. Viewers are encouraged to physically interact with The Eastern Oracle and to use it as a place for self-reflection and self-empowerment. While interacting with the installation, visitors must adhere to the following guidelines: wear flat, rubber-soled shoes or sneakers; be at least 10 years old; children under the age of 18 years old must be accompanied by a guardian; do not carry any items, such as a purse, camera, or cell phone. Hart received a B.F.A. from Cornish College of the Arts in Seattle in 1998 and an M.F.A. from Rutgers University, New Jersey, in 2008. She was recommended for Raw/Cooked by advisory board member Mickalene Thomas. Visitors climb The Eastern Oracle at June’s Target First Saturday. Heather Hart discusses The Eastern Oracle.